You have a good idea of what you want to feed your guests at your wedding, but how best to serve it can be something of a challenge. Most of us know only two styles – service or buffet. But these days there are more options. Just as it sounds, this formal style of serving food involves waitrons serving individual plated meals to guests, pouring wine and generally bringing food to people, rather than allowing them to fend for themselves. It’s great if you’re wanting an atmosphere of elegance and sophistication, but it can be expensive and does not allow your guests to mingle and relax. 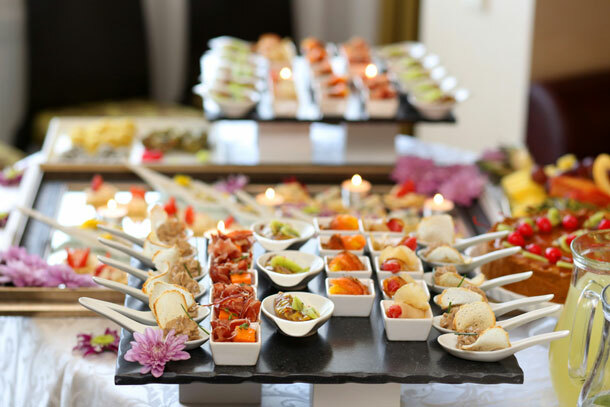 Guests line up and choose from an array of different trays of food whilst serving themselves. This is a less formal arrangement that allows your guests to eat as much or as little as they like, and to select the foods they are most comfortable with. In this way you can also accommodate dietary choices and do with fewer waitrons. This style won’t work if you have too many guests as there could be a rather long line. I hadn’t heard of this particular ‘term’ but you know the style anyway – it involves formal service but food is brought in large platters to each table, where those at the table can then help themselves – very like your typical family meal at home. This is ideal because you cut out the ‘cafeteria’ feel to standing in line for food, whilst still allowing an element of buffet to the meal. It’s a mix of both of the former styles, and works best with round tables. Not great for a formal wedding. This is a way to have fun with food, and suits a less formal or small wedding most. It’s buffet in the sense that guests get up to help themselves, but food is divided into different sections around the room. Food is generally divided into food ‘styles’ – like a coffee station, a Mexican food station, a pasta station, a sushi station, an ice cream station etc. Some people make use of food trucks, which add a fun element.